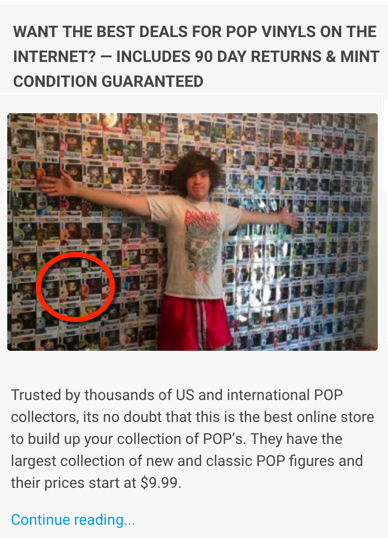 The Popvinyl.net Buy and Sell Facebook group is a Trading group for Funko collectors which enables collectors to perform trades amongst each other via the Facebook Group, however we do allow users to share images of collections and finds, customs, discussions and Q&A’s. 1) Do NOT post website/Youtube/facebook page links, we are aware that some people may have blogs/vlogs/pages/groups but we are strickly a BST Facebook group and we do not allow cross promation with out permission from the admin. 2) Posting e-commerce shops that sell Funko items is strictly prohibited unless they are part of our whitelist of shopping sites you can post. Check out the white listings below. Please contact the admin if you wish to post your own site. 3) Lootcrate or other subscription box affiliate links are Not Allowed. 4) Every user is entitled to 1 post bump a day per thread, anything more than that will be considered spamming. 5) Starting duplicate posts is also considered spamming, use your free post bump per day to keep your listings to the top of the facebook feed. 6) Exploiting facebooks PM and comment messaging capabilities to solicit users for promotional use for either goods and services is not allowed. 7) Group giveaways or raffles are not allowed unless previously discussed and approved with the admin. 8) Mystery (POP!) Box Sales are not allowed unless approved by the admin first. 9) Threads Gauging interest, asking what a pop is worth and “Hit me with offers/OBO” from members of the group is not allowed. 10) Selling replica Funko Boxes and/or Stickers is prohibited. 1) There is zero tolerance towards trolling and bullying, if anyone is found to be doing either one of those things they will be issued a warning notice and repeat offenders will be removed from the group. 2) Obscene, racist, vulgar language and any sort of name calling in that nature is not allowed in this group, we expect all users to behave in a civilised manner. First time offending users will be warned and 2nd time repeat offenders will be removed. 3) Respect the Admin and other users around you and treat others like you would like to be treated. Being on the internet some of us tend to develop an online attitude and think its ok to treat people with no respect, Wrong! If any users are found to have attitude problems and are not prepared to clean up there online acts before they enter the group they will be eventually removed. We like to consider ourselves as an easier going group, we are not ‘ban hammer happy’ admins here, we like to give everyone a fair go even if a user does stray from the guidelines. That being said we will take necessary action to keep the group in order and a pleasant place to be apart of. So please respect and follow the rules. 4) What NOT to post. The general rule of “if you cannot offer any positive value to the group, then please do not post” applies. a) Whining and Complaining threads – topics pertaining to flippers, scalpers, resellers, we have all heard it before and we don’t need another thread about it. How to report a thread on facebook. Disclose the price, location, Shipping details and images of the items in question. no glam shots, only images which accurately show the condition of the items you are selling. All buyers and sellers should use their due diligence, if you think something isnt right about a seller or buyer please provide some sort of evidence (chat logs, screen shots) and contact the admin and we will intervene. When buying and trading items its safer for users to use paypal as a form of payment. Note: Never make gift payments unless you are 100% sure the seller will deliver. Always use the standard payment method with paypal and if someone tries to coach you otherwise we recommend not going through with the sale and contacting the admin right away. Sellers are recommended to factor in the 3% paypal fee which is added for a regular transaction, this will save a lot of misunderstandings. In the case where a transaction goes sour between parties please contact us immediately we will intervene and contact both parties in attempt to settle the matter. Please note: that this doesn’t insure a refund or the retrieval of your items. In the case where a member has illustrated scamming activities we will remove the offending member and make a note of it. If you are found bashing peoples Ads or looking to interject the thread with your own offering you will be warned or removed. When it concerns Buy and Sell listings, members are expected to behave in a mature manner, this includes no bashing peoples prices or items they have up for sale. If you have a problem with your listing or another persons listing please contact the admin. Item for Item trades: Where the buyer and the seller agree on a mutual trade of items is NOT RECOMMENDED. Why? This way of trading has illustrated to be an unsecured way of trading and has proven to be a common exploit for scammers to get their way. No buying and selling from persons below the age of 17. There are always going to be people who are going to sell Funko products for a profit, depending on your view on this. If you do see a ‘Flippers’ post and you are looking to give them a piece of your mind (so to speak), Don’t! and think about the rules you will be breaking. Calling ‘flippers’ out will inevitably compromise your status with in Trading Group and offending members will be removed. 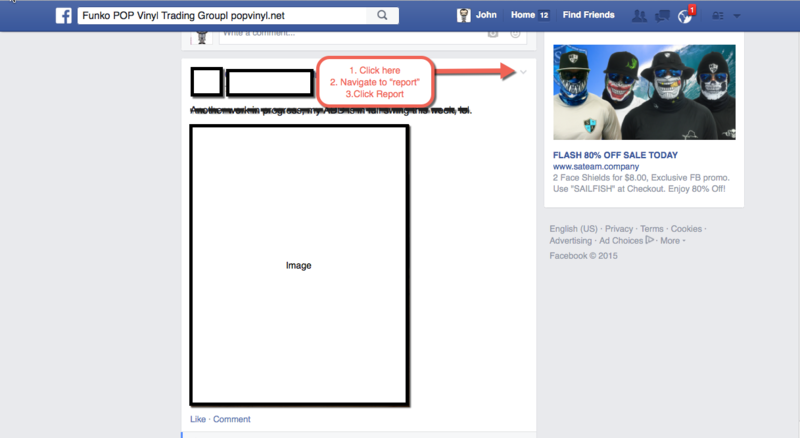 Ignore them or Block them from your Facebook Group Feed and you will never see them in your feed again. How to block a member from the group? Navigate to the ‘Add Friend/Message’ Tab but click on the three dots next to the ‘Add Friend/Message’ button. We are open to feedback if you think there is something we can improve on we would like to hear from you, please contact the admin here. Thanks for the updated information. In the interest of quality: on the White List: Barns and Noble should be Barnes and Noble, and later in the post there’s a title that reads Just be Be Nice…I’m wondering if that should just read Just Be Nice. It’s just a good idea to make sure all of your communications are of the highest quality so people see you are serious about what you do and say. Thank you for your consideration. Are listings for custom figures allowed?